ot4kids is a small, independent practice established in 2009 with a base in SW London. We predominantly see children from birth to 12 years around London in their homes and schools. I’m looking for a colleague to join us that uses a modern multi-dimensional approach with a sensory integration focus. Supervision and support is provided to ensure a quality service. The role would suit an OT with 1-2 days or some evenings available. There is room for growth and to increase hours. This entry was posted in Uncategorized on April 28, 2017 by munira. Sonia Sumar is an amazing teacher with lots of personal wisdom to share. I have never taken a course that wasn’t offered by an Occupational, Physical or Speech Therapist. I had no idea I was going to learn about chanting, meditation, and lots of life lessons from Sonia versus just yoga (body) exercises. It has been as good for me as it has for my son and kids I work with. A year later, I regularly do my own yoga routine learned in the course and have felt stronger, healthier and more energetic overall. The kids and my 3-year old love it too. -deep relaxation – it’s amazing how many of us can’t still our bodies or minds to relax. I’m still working on this myself and it’s a tough one. This entry was posted in Uncategorized on May 26, 2015 by munira. 1) When a baby struggles with feeding, we would assess their tolerance for touch with their body and in their mouth, oral motor skills in their mouth for nursing or eating foods, muscle control in their core / neck / shoulders, and their body alignment and positioning for feeding. See more here. 2) If a baby has a flat spot on their head or turns their head to one side (plagiocephaly or torticollis), we assess their core strength, body awareness on the weaker side, motor planning, eye movements, jaw alignment and oral motor skills, which muscle groups are weak or tight, tolerance for movement and motor skills using both sides of their body. 3) Another common scenario is when the child is described as a ‘lazy baby.’ Usually there’s a reason for this. They may be sensitive or fearful of movement, have difficulty figuring out how to move their body, or have weak body strength and stamina. Sometimes the baby could have a lower state of arousal and need more sensory input (touch, muscle / joint and / or movement input) to rev up their engines the so they feel the urge to move and play. When we explore deeper, there are underlying areas we can develop. And as babies are changing and growing so fast thanks to brain plasticity, they have amazing potential to progress at a faster rate. Early intervention helps. If you have any concerns about your babies’ development, feel free to contact me to have a chat and discuss further. What does a baby OT assessment with me look like? This entry was posted in Uncategorized on April 6, 2015 by munira. 1) Baby uses their own muscle strength to get into a position versus being forced to hold a position that their body can’t handle which can lead to muscle strain or locking joints for stability. 2) Develops body and spatial awareness. As the child uses their own body (muscle and joint) sense to get in and out of positions, they develop an innate body awareness and sense of space around them. This is much safer as the child can get their own body not only in the position but ‘unstuck’ to get out of it. When placed in a physical position by an adult, they aren’t required to use their own body sense to move. 3) Develops motor planning skills – the baby has to come up with the idea to move, plan how to move their bodies, and then make the move. These skills are so important for motor planning and the beginning to problem-solving, sequencing, and figuring out how to do new things – all skills children need for pretend play, being independent and school projects. 4) Increases balance – by completing movements actively themselves, balance and confidence improves. Active movement develops ones movement sense and stability more than passive sensory input. The movement system has strong links to one’s ability to calm and self-soothe, be alert and focused and much more so it’s a good one to strengthen. In my professional and personal experience, I find that children who can move in and out of positions on their own versus being placed in positions are more safe and stable, have better posture and are less slumped over, more flexibility and variation in their motor skills, less sensitive or fearful of being moved, and are comfortable getting in and out of different positions. As a paediatric OT, I will use sensory processing, Neurodevelopmental, myofascial, socio-emotional or play-based strategies to help the child develop the skills they need to be flexible and functional in their motor skills so they own their own movements, and can be more safe and independent in their play. This entry was posted in Uncategorized on March 13, 2015 by munira. **Disclaimer: The following are just ideas and must be used at your own discretion for safety. Please be sure to use appropriate soft padding, measure for size in your space, and most importantly, provide supervision for your child’s safety. I’d love to have more DIY skills or even a little workshop to build toys and equipment. But alas, I often resort to Amazon! I’ll share some swings, trapezes and other equipment I’ve purchased from Amazon or local shops that kids really like. Firstly, I’ve bought carabiner hooks and rope from a local outdoors climbing shop. Make sure the carabiners will hold the amount of weight for your child to safely swing. When looking for rope, consider whether your child will do better with static rope which has no give and will be less unpredictable, or dynamic rope which has some stretch and bounce to it. I have also used aerial yoga ‘daisy chains‘ to help adjust the swings either higher or lower if kids need their feet to be close to the ground. Please note I have included affiliate links below so do receive a little £, however all proceeds go to charity. Trapeze with gymnastic rings for hanging by arms and also hanging upside down. Crow nest swing seat – add pillows and blankets here for nice calming deep pressure input. It appears very similar to the IKEA Ekorre Swing. Hammock swing – There are many different varieties and although I often suggest to parents to go to the fabric shop and feel the material and how stretchy it is (if your child likes bounce, a stretchy one may be great, if they need a calming space, a less stretchy lycra one may be more suitable). I have both a lycra hammock and a Yogapeutics hammock which has no-give for different situations. Nest Platform Swing – This swing looks like it could be used from different positions similar to a platform swing, albeit, not the same. Perhaps a more economical option if you struggle with DIY like myself. This entry was posted in Uncategorized on March 6, 2015 by munira. This time I thought I’d share more on how to make some swings. In my clinic, I mostly use my homemade platform and hammock swings. Personally, I love the hammock swing after a long day and my toddler would love to nap in it. I wish I were a bit more handy and could actually sew, I’d create a lot more. If you’re into DIY, you could make this. Here are a few alternative ways others have made their platform swings. This one is so easy to make and requires no sewing or tools. For mine I bought 4 yards of Lycra material from Fabrics Galore on Lavendar Hill in London. I tied a knot on both ends through a ring and then attached it to my swing ropes. Here are some other more detailed guides. I don’t have one but kids I previously treated loved playing bumper cars with these at my first job in California. This is on my wish list along with a homemade bolster swing. It looks relatively easy to make if only I could sew. Next blog post, I’ll share some of the swings easily available locally. This entry was posted in Uncategorized on February 20, 2015 by munira. **Please note all ideas shared in this blog post are to be done at your own risk or discretion. It’s recommended to have an engineer or contractor assess your ceiling structure to determine whether it is safe and sturdy. During OT sessions, parents often want ideas they can replicate at home, especially activities their kids really enjoy. Swinging often falls in this category. Part of classical sensory integration therapy includes using suspended equipment and therapeutic swings. Although there are lots of other effective and fun ways for children to get movement input without swings, swings are an option for the home. Here is a great resource explaining different ceiling hooks. This is where an engineer or contractor will help. This is a good alternative if you can’t access a ceiling for swings, especially if you happen to have a double doorway. 🙂 Prior to my current clinic space, I used the Rainy Indoor Playground Support Bar, however now am fortunate to have a larger area. Many parents have also installed a pull-up bar in their doorway from which they’ve attached a swing or trapeze. For those in the US, there’s an Indoor Gym which I haven’t tried but looks interesting. I’d love to do this when my son is ready to sleep in a loft bed. My neighbors are so lucky to have a great tree from which they’ve hung a cool IKEA swing for their kids. If you do too, consider attaching swings there. Here’s a tree swing kit on Amazon. For all of the above ideas, be sure to put down an old mattress, crash pad or gym mat under and around the swing for safety. This entry was posted in Uncategorized on February 6, 2015 by munira. We usually visit family in Canada for the holidays. It’s a nice way to come back to London feeling refreshed and relaxed. It’s also always exciting to hear about everybody’s holidays, and see the new things the kids I work with are up to after a break. As most families know, I usually return to London with new goodies for my OT sessions. Last year, it was the PeaPod and Ziggle which have been great except that my PeaPod received a lot of love and ripped already. 1) An aerial yoga hammock swing from Yogapeutics – it looks and feels lovely. Can’t wait to relax in it myself and try some new moves in it. I know my little guy will love it too. 2) Air-lite bolster swing from Fun and Function – I was planning to make a bolster swing but these kind of projects take a long time especially when you have a little one and aren’t as handy in the DIY department. This one looks to be easily portable and just the right challenge I’m looking for. 3) Dreampad by Integrated Listening Systems – I’ve been wanting to try this for myself, my son and kids I work with. Hoping it will help with sensory regulation, calming, and sleep. You can read more about it here. Wishing all of you a Happy New Year filled with peace, joy, light, prosperity and fun. This entry was posted in Uncategorized on January 6, 2015 by munira. It’s been a while since I’ve been here for a blog post. Now that my little guy is 2 3/4 years :), I’m hoping to pop over a bit more this year. Fingers crossed. For any of you who are a bit behind with gift ideas for the holidays, I thought I’d share some sites where I’ve also gotten some new ideas for my clinic wish list. These pages will be useful for other celebrations such as birthdays. I’m constantly updating my Amazon UK store. Ideas here are broken down by age (babies, toddlers, school age) and by skills (sensory, motor planning, gross or fine motor). There’s also a books section for parents and other professionals. 18 ‘mom approved’ toys by a mum of a child with special needs. Thanks to Parenting Special Needs Magazine for this nice list of toys especially considering children with less motor skills. This entry was posted in Uncategorized on December 19, 2014 by munira. This is my first blog post in perhaps two years! I’ve been pretty busy with my now-toddler-then-baby but this is a topic very close to my heart. I lived it and breathed it for a whole year which is how long it took for my little guy, M, to become ‘functional’ at breast feeding. It is also something that many of the families I work with have or do struggle with so I wanted to share our story. Following birth, M immediately struggled to latch on and nurse. He was only 2.2 kilos so we were kept in the hospital for a few days. We received a lot of advice from the midwives of which all were conflicting and really, although my Occupational Therapy head knew better, my new-mum head was a bit overwhelmed and second-guessed myself. I always tell parents to trust their own gutt instinct. I contacted a speech feeding therapist of mine whom I hugely respect at day 3! We were so fortunate to have her support as the NHS speech therapist said there’s nothing to do until M eats foods. Not only couldn’t we wait but I knew better. Please know this is so not true. It was important to strengthen and develop M’s jaws, cheeks, lips, and tongue so he could nurse and later, eat foods and talk. At 4 months, we saw an osteopath I’ve known and worked with. She worked with M using a classical approach, loosening and mobilising tight areas, so he could be more comfortable in flexion and move his body forwards, ESP his tongue. She also worked on his gutt mobility so that his body could best absorb nutrients, digest, pee and poop. A Jin shin Jyutsu therapist worked with M on relaxing his body via different Asian flows. I, OT mummy, worked with M to become more comfortable with touch, movement, and sounds, develop his body awareness to move with more flexion and be able to bring his head forwards, move smoothly in and out of positions, and coordinate both sides of his body versus only move via one side. We also worked on positioning M’s body so he could be more comfortable with feeds. Once his body was more comfortable, his mouth followed suit. The oral motor therapist worked with us on different feeding positions for myself and M to support his breastfeeding needs, supporting and strengthening his jaw, how to strengthen the oral muscles using specific, targeted exercises on the tongue, cheeks, lips, and jaws. Private DAN doctor inspired by Asian medicine – He confirmed he wasn’t concerned about weight and size, continue with breastfeeding versus formula, but was more concerned about gutt absorption of nutrients. So he prescribed us some chinese herbal supplements, vitamins, probiotics and MCT oil which apparently is a natural ingredient already found in breast milk. By 10 months of age, breastfeeding had finally become very comfortable. Using breastfeeding as a therapy gave us the chance to work on M’s sensory processing and oral motor skills soooooo many times during and before every feed. We were fortunate to receive a lot of amazing, private support from very early on. During times, we felt desperate so also tried many ‘wrong’ things before figuring out what they worked. But as they say, it took a village and I really believe we need to support families with breast feeding challenges using a whole body and a collaborative team approach. What did I, OT mummy 🙂 do that helped? -Worked on sensory defensiveness, flooding M with calm, sensory input. Deep pressure input, linear movement input, building tolerance for movement in different planes using music, rhythm and predictability, heavy muscle and joint work for added proprioception to his body and mouth, and building tolerance for multi-sensory input. ‘Baby wearing’ was a huge part of our life for all sorts of positive sensory input. -Before every feed, we did some gentle body work to build motor skills and body symmetry and encourage flexion. -Targeted oral motor exercises for cheeks, tongue, lips, and jaws before feeds and later, when starting solids, we had therapeutic feeding strategies. -Used straw and open cups as no concerns with aspiration, or safety of swallow. -Positioning – Swaddling for feeds was a huge help and he relied on this till 7 months. I laid semi- reclined so M kind of ‘fell’ into me and gravity could help. -Music –I remember using classical 90-beat Baroque music for children feeding in the hospital so we tried this too. -An invaluable source on breastfeeding and busts so many myths. This entry was posted in Uncategorized on June 23, 2014 by munira. 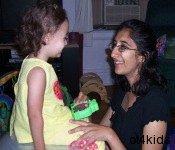 When I moved to London 5 years ago, few people knew about occupational therapy especially for children. There was even less awareness about early intervention (EI) and sensory integration therapies. I had gone from having a caseload full of babies and toddlers whilst in New York City to only one baby here in London. It was so sad to hear others say ‘wait and see’ and ‘your child will grow out of it’ especially when I had firsthand seen the difference early intervention makes for the entire family. During my first several years in London, I spent a lot of time raising awareness and advocating for children who have special needs and developmental delays by developing my website as a resource, and writing articles for National Childbirth Trust (NCT), Families and special needs magazines. I also held baby ‘Move and Groove’ groups with many local NCT mums groups to advocate for early intervention, encourage and show parents how to help their baby move in and out of different positions. Many parents were nervous to put their babies on their tummies. It was great fun and a fantastic opportunity to advocate for EI. Five years on……I now treat lots of babies and toddlers. Although parents come to me by word of mouth, many want to start early as a means of prevention and so their child will be more ready for school and require less support. I still treat children up to 7 years as its important to see how kids grow and what they face in their future. This entry was posted in Uncategorized on August 20, 2013 by munira. Please note that I will be away from 5th to 25th of August, ’13. I will not have access to voicemail or text messages. If you would like to reach me, please email me at munira@ot4kids.co.uk and I will respond within 1-3 days. Thank you and hope all of you enjoy the rest of summer. This entry was posted in Uncategorized on August 4, 2013 by munira. Babies – Early Signs: How do you know? People often wonder how soon can you tell a baby requires early intervention therapies. I thought I’d share a little bit based on my experience with my own son and babies I treat as well as common red flags from other parents. I hope it will help others. First of all, parents just know! They have a gutt instinct and are always right. Sometimes as a mum, I know it’s hard to follow your own gutt especially when others around you say it’s too early or your child will grow out of it. Please know that as a parent, you know your child best. Secondly, babies’ main daily living activities are to move, sleep, feed, and poop. Usually, if these areas are a challenge, you will have an idea that they need some support. For my son, I knew as soon as he was born and we were moved into the maternity ward. He was the only baby constantly crying, he had a hard time with breast feeding – struggling to nurse more on one side, startled at every sound that went by, only wanted to be on his tummy being very uncomfortable on his back, had too great head control for a newborn, and was unable to fall asleep. Everybody, including strangers on the street, always commented on his head control (which was too good for his age because of tightness) and how alert he was (due to being in an over-stimulated state of arousal). These are just some examples. If you have any concerns about your child’s development, please see an occupational therapist right away. Do not wait and see. Start early, there’s so much to do from the beginning versus when the child starts school and skills become ingrained. Babies are like sponges due to brain plasticity. Its really so encouraging to see how quickly they respond with the right support and early intervention. This entry was posted in Uncategorized on July 9, 2013 by munira. Baby Evaluations – Never Too Early! People are often surprised that I work with babies. They wonder whether it’s too early, do all babies just develop at their own pace, or how does one work with a baby. Fortunately we now know a lot about early intervention and milestones tell us about a child’s development. Early detection and early intervention can minimize or in some cases, eliminate issues that arise. I know this both professionally and personally as a mum to a 15-month old who has thrived due to having early intervention support from his very early days. As they say, babies mostly sleep, eat, poop and I add, move. 🙂 If any of these baby ‘occupations’ are a challenge, occupational therapy may help. Based on the assessment findings, we do different exercises to address areas of need. I show parents various carrying techniques, positioning and therapeutic handling strategies to develop sensory and motor skills, as well as ideas of how to address sensory, emotional, motor and play skills for the baby’s age. Parents are given a home program of exercises to complete with their baby and we address skills during therapy sessions. Prior to the assessment, I ask parents to send me information regarding the child’s birth and medical history, services to date, general concerns, any medical reports, and a completed questionnaire. I also love to see photos of the baby in various positions to help me get to know the baby and plan for the session accordingly. If parents are concerned about their babies’ development, I suggest do not wait and see, early intervention is critical, and better to address areas of need now versus waiting till the child is older and struggling in school. This entry was posted in Uncategorized on June 16, 2013 by munira. Traditionally, Occupational therapists treat children 1-2 times per week over a long-term, oftentimes for years. Research from the SPD Foundation indicates that children actually benefit more from intensive blocks of treatment. This is the chosen model of treatment at Lucy Miller’s STAR centre in Denver, Colorado. I am a huge FAN of this model. For the past several years, I have also been doing more intensive blocks of sessions followed by a break, and then another intensive block. The frequency of the intensives vary based on the individual child and family’s circumstances, however they can for example run from 2-4 times per week over a 3-5 week period. Children then have a break for 1-3 months followed by another intensive block of treatment. The break is a fantastic time for children’s to solidify their new skills and integrate them into daily life. During this break, kids often participate in their favourite activities whether it is going to the park, swimming, horseback riding, learning to ride a bike, cooking or having play dates. This entry was posted in Uncategorized on March 27, 2013 by munira. OCCUPATIONAL THERAPY ASSESSMENT – What’s it all about? Parents often wonder what’s involved in an occupational therapy assessment? This really varies amongst Occupational Therapists based on our experience and interests, what the parents want the child’s individual needs. In my practice, this is how it generally goes. Initially, parents call and we have a phone conversation where they tell me about their child, their concerns and reason for an occupational therapy assessment. I prefer to talk about any sensitive topics during this time versus discuss in front of children, particularly older kids. We then determine whether or not an assessment is necessary. Reports from other therapists including educational psychologists, consultants, and speech therapists. Completed questionnaires or sensory profiles by parents and school. The actual assessment varies based on each child and their needs. No two children are alike. For the first part of the assessment, I usually chat with the child and parent to get to know each other. During this time, the child often explores the clinic and engages in free play while I make initial observations of how they move, interact, and play. For older children, I ask about their hobbies and interests, how they find school, and what they’d like to do. Both parents and children are involved in this discussion as appropriate. -*****Child’s STRENGTHS. This is so important as we will want to continue and encourage these in the child and also, use this to build on areas that need help. We are not trying to change the child but want to embrace them for who they are. -Sensory regulation, how the child transitions, manages multi sensory input, copes with daily challenges and demands, attends and focuses during self- and adult directed tasks. Throughout the assessment, parents are involved and present. I provide suggestions of exercises and activities to try at home. We will try some exercises and activities together. Summary and recommendations: Towards the end, we review findings of the assessment, prioritize concerns of parent and child, discuss home exercises, and come up with a plan of what to do and how to work together with the child’s home and school team. Based upon the child and parents, the initial assessment can take from 1-2 hours. This entry was posted in Uncategorized on March 16, 2013 by munira. In the UK, occupational therapists must be registered with the Health Professions Council. In the US, occupational therapists are registered with the National Board for Certification in Occupational Therapy. -Sensory Integration – In the UK, there are a series of four courses offered through the Sensory Integration Network. In the US, these courses may be offered by either Western Psychological Services or Sensory Integration International. Have a look here to learn more. It can take years to complete the coursework and all the requirements to pass and become certified in Sensory Integration. -NDT (Neuro-Developmental Treatment) Certification also known as Bobath Approach. This is an 8-week course for children with Cerebral Palsy or any motor impairment. For me, the course was a labour of love & rather intensive. Therapists often make some sort of life compromise to complete the certification such as temporarily moving to the town where the course is being held, or leaving their families for long periods of time. For therapists who are NDT certified in the US, this requires a continuous process of updating information via ongoing continuing education and professional development. You can learn more here. – NDTA Advanced Baby Course – 2 to 3 weeks – This certificate course can only be taken after the 8-week course above and is an add-on to specialize further into baby treatment. I took mine in what felt like the boonies, Allentown PA, however it was completely worthwhile to have spent this time with baby guru, Lois Bly. 4) CONTINUING PROFESSIONAL DEVELOPMENT – I would look to see that the therapist takes ongoing continuing education courses in a variety of areas. I list most of my CPD on my ‘About Me’ section under CV for others to see how I stay current. 5) EXPERIENCE: What’s their experience? How long? Where? What population do they work with? 6) SPECIAL INTERESTS: Do their special interests relate to your child’s needs? E.G. Baby treatment, pediatrics, splinting, kinesio taping, seating and wheelchairs, assistive technology, home modifications, oral motor / feeding therapy, listening therapies, yoga, brain gym and so much more. 7) LISTENS TO YOU: I find it encouraging when our team members listen to and involve us. After all, parents know their child best. 8) CREATIVITY: Fancy clinic equipment is great however I have seen great therapists do so much while working in a shoebox or with very little. Creativity goes a long way. 9) COST – Personally, I have found it so worthwhile to have fewer sessions with a more skilled therapist versus more sessions with less skilled ones. It’s important to look at the therapist’s credentials, approach and personality to find a good fit. This entry was posted in Uncategorized on March 9, 2013 by munira. When I moved from NYC to London, half my boxes must have been full of toys and books! Whenever I see a new toy shop I must see what’s inside. Usually, I love the old classic toys mostly in thrift shops or on eBay now. Occupational therapists love toys, activity analysis, figuring out what skills toys are working on, or how to adapt them to suit a child’s individual sesorimotor needs while offering just the right challenge. We also love finding interesting ways to use these games such as via an obstacle course, combined with therapy ball exercises, or from various gross motor positions. Talk to your OT to learn how best to adapt games to address your child’s goals. I often use games from my childhood. 🙂 How many of you remember playing thumb war, French skipping, throwing balls against the wall, playing Jax, or making cootie catchers and cats cradle. For birthdays and holidays, parents will often ask me for gift ideas that will address their child’s areas of need and that they will find fun. I love doing this. It’s like making a secret special super wish list for the child. I receive a little something should you buy from my store. All proceeds will be used for charity or therapy toys for those in need. Have a look. I’d love to hear if you have any favourites. This entry was posted in Uncategorized on November 28, 2012 by munira. Children have an inherent desire to please. They don’t intend to be naughty or mean. I work with many children who are punished at school for acting out or being ‘naughty’ however their ‘behaviour’ is actually in response to sensory overload. It’s important to put on our detective hats for these children to determine the cause of their behaviour and how we can help the child be more comfortable with their bodies and environment. An Occupational therapist trained in sensory integration can help. For children with sensory processing disorder, the demands of school can be over stimulating resulting in a meltdown. During this time, their nervous system enters a fight-or flight response as a protective measure. Noises can be too loud, lights too bright, classrooms too busy with ‘decorations,’ kids sit too close, it’s hard to sit still, and large spaces such as gyms or playgrounds are overwhelming. Dealing with this all day long often results in a meltdown either at school or by the time the child gets in the car or home. Check out this wonderful diagram on Facebook’s Autism Discussion Page describes ‘Stress Overload at School. So, how can children be helped? During a meltdown, find a quiet retreat where the chid can calm down. This may be a corner of the house or class with pillows, fidgets, or a beanbag. It could even be under the teacher’s desk. Do not treat it as behaviour! Here are some ideas of quiet spaces. -Providing breaks for movement and proprioceptive inputs during the day. Have your OT help figure our what works for the child. -Help the child identify when they start to feel overstimulated. What is the trigger? Touch, sound, novel activity, going to the cafeteria? -Teach the child how to label their emotions so they can verbalise when they feel stressed. Here is a brilliant handout to share with teachers and professionals about sensory overload and meltdowns. This entry was posted in Uncategorized on November 22, 2012 by munira. 1) Deep pressure input, warmth, and comforting smell of parent are calming and organizing. This is particularly helpful for babies who are sensitive to touch, movement, or sounds, who have had long NICU / SCBU stays, or who need support settling into the big, outside world. 2) Boundaries of the carrier give body input and awareness for comfort and motor skills development such as babies with low tone, sensory motor difficulties, or prematurity. 3) Vestibular / movement input – the gentle bouncing, rocking and swaying motions provide movement input which is again soothing but also helps stimulate tone for balance and coordination and make sense of one’s body. The vestibular system is also strongly connected to the visual, auditory, and emotional centres of the brain. Movement helps kids focus, learn, and coordinate both sides of their bodies. 4) Powerful way to bond after a traumatic birth and from personal experience, so fun to interact with baby wherever you go. You can see how it can either help decrease sensory overload for sensitive babies or provide extra input to babies who need more sensory information. By integrating, touch, body and movement input, we are helping develop multi-sensory processing. 1) Encourages flexed positioning – oftentimes babies with traumatic births, brain bleeds, prematurity, low tone, or sensory processing disorder assume an extended posture due to tightness, arching their back or sensory overload. Heathy, full-term babies are in a flexed curled-up position from the womb. Extension is a red flag. Slings and carriers can be used to help encourage this flexed position. Have your occupational or physical therapist help with positioning. 3) Alternative to tummy time – many babies struggle wit tummy time for varied reasons. Baby carrying can be a gentle step towards tummy time by holding your baby against you. 4) Upright positioning can be more comfortable for babies with reflux, gutt, or respiratory problems. Visit a sling library to try different carriers and find what suits you and your baby. This entry was posted in Uncategorized on November 10, 2012 by munira.